The Iranian method: to advance nukes through deception. The time to act is now - or never. President Barack Hussein Obama's superficial and deferential manner of mending fences with Iranian clerics triggers disquieting skepticism over Iran's covert nuclear program. With its illusions of diplomatic grandeur, Obama's speech at the United Nations General Assembly; in which he cited Ayatollah Ali Khamenei's "fatwa,", or religious edict, in defense of Iranian intentions, is an elaborate grand deception. Obama's behind-the-scenes maneuvering on Iran is a monumental distraction that raises serious questions as to why the United States seems to appear on the defensive and is, to all intents and purposes, 'aiding and abetting' enemies of Israel and America. It is quite obvious at this point that Obama is 'playing Russian roulette' with Iran's nukes in exchange for an illusion of regional peace and diminished American presence in the Middle East. The impact on Israeli geo-politics is stunningly difficult to contend with. But in any event, Israeli leaders believe that the more Obama continues to falter and 'drift toward a nuclear tipping point', the faster he is losing a game of three-dimensional chess where Iran is the grandmaster. At the outset, this latest round in a series of charm offensives by the new Iranian president is a well orchestrated diplomatic swindle. Make no mistake. The Iranian attempt to deceive the U.S. and the world did not diminish the chances of an Israeli strike against Iran's nuclear program. One thing is certain. A diplomatic solution is impossible in light of Iran's deceit and refusal to give up its nuclear ambitions, which have become the symbol and source of its national pride. Israel cannot afford to hide behind the dark shadows of Iran becoming another North Korea. We are witnessing a new era of Middle Eastern diplomacy based on deception even more blatant than Arafat's on the White House lawn at the signing of the Oslo Accords. Team Obama's doctrine of leading from behind is another bogus and cynical foreign policy of hesitation, delay and indecision - and a flawed strategy is no strategy at all. In any conflict whatsoever, the deliberate display of weakness and the telegraphing of one's military plan of action to enemies - explicitly undermines leverage, exposes vulnerabilities and causes damage to credibility. Put another way, "a leader who hesitates has lost the battle" in any conflict. And, for that reason, Obama's Syrian war was lost even before it would have begun. For all the wrong reasons, there is no telling whether whatever happened to Syria's WMD's could happen to Iran's illicit nuclear program. But Iran is not Syria, and the only way Iran will abandon its nuclear ambition is by tightened up sanctions and a credible threat of military action. As a consequence of Obama's colossal blunder on Syria and his follow-up at the UN, a wrong message was sent that emboldened Iran. As Iran declares victory over Obama's UN speech, the senior military aide to Iranian Supreme Leader Ayatollah Khamenei said that Iran has strong-armed Obama into accepting its nuclear rights, Fars News Agency reported. The incontrovertible fact remains unsettling, uncertain and undeniable: the Islamic Republic's modus operandi was to advance nukes through deception- to buy time so that Iran could attain a nuclear-weapons breakout before the end of the year - and it is working. 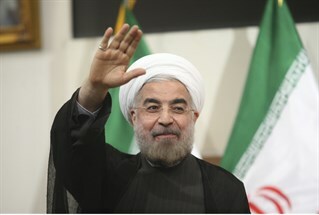 Iran's new president Hassan Rouhani believes that "the sanctions on Iran will be lifted once its nuclear program is finished and the world realizes it cannot be undone"; saying, in effect, that under the supervision of the supreme leader he was "to make sure of this deceit". Incredibly, Rouhani’s "tactic" was revealed in a videotaped interview showing him bragging that he deceived the West and claiming credit for vastly expanding the regime’s disputed nuclear program. In addition, a Paris-based dissident group exposed Rouhani, falsely depicted as a "moderate" as a key developer of the newly-revealed secret nuclear site. Meanwhile, the Sunday Times reported that Israeli Prime Minister Benjamin Netanyahu will present Obama with an intelligence dossier containing evidence that Iran is stepping up its ballistic missile and nuclear program since June, when Rouhani was elected. At the final day of the UN General Assembly meeting, the unrelenting Netanyahu wants to drive home the notion that Iran is sponsoring global terrorism and Rouhani's 'charm offensive' was a fraud and a waste of time. Contrary to what political pundits may want you to believe, Netanyahu would prefer diplomacy and containment over military action if Iran would give up its military nuclear program. In the Israeli context, diplomacy has failed. From a regional stability perspective, Israel cannot afford to hide behind the dark shadows of Iran's becoming another North Korea. In Netanyahu's warning to the White House about Iran, the prime minister has laid out four demands : that Iran stop enriching uranium; that its stockpiles of enriched uranium be removed from the country; that a fortified underground enrichment facility be closed; and that Iran not make plutonium, another possible path toward nuclear weapons. Although, Iranians may claim to be masters of deceit, Israel's superior military edge is unmatched in dealing with the emerging threat and the country would take steps to remove it. A determined Israel means what it says and when the Israelis do act on their words, they will be unforgiving. If Israel strikes Iran's nuclear sites, there is nothing Russia or the U.S. can do to prevent it. A nuclear armed Iran is an existential threat not only to Israel, but to the U.S. and the world - for it could spark an unrelenting "gigantic catastrophe" for the spread of doomsday-weapons in the Middle East and beyond. Although the repercussions to Obama's monumental blunders will haunt the U.S. for many years to come; there is no doubt about Israeli resolve to protect and defend the only Jewish state in the world. As it turns out, Iran has exploited the weakness of a highly narcissistic "lame-duck" U.S. president through "gestures and illusions". The Islamic regime's feeble-minded rhetoric to "wipe Israel off the map" is self-evident in what it does to conceal its nuclear weapons program. Iran claims its nuclear program is peaceful and intended to produce electricity, while its regime has invested heavily on building more ballistic missiles and underground nuclear facilities. Amidst a frightening reminder of the Holocaust, the time to act is "now or never." Time is the essence. Israel should now be able - while there is still time to confront Iran's plan - to shift the balance of power in the region .In the absence of true diplomacy- there is no better option than a pre-emptive strike to neutralize Iran's proxies, the one in Damascus and the Hezbollah in Lebanon. In absolute terms, when Syria and Hezbollah fall, Iran collapses. Simply put, the fall of Damascus is a coup de grace against Iran. So, no matter what the U.S. decides to do, when fighting an unconventional war, Israel should be able to launch an overwhelming military force without hesitation or restraint regardless of unintended results. As former Israeli foreign minister Avigdor Lieberman once emphasized, quoting from "Epitoma Rei Militaris" by the Roman Vegetius: Si vis pacem, para bellum. "Whoever thinks that he will achieve something by way of concessions, no, he will only invite more pressure and more wars. If you want peace, prepare for war". Israel's current Defense Minister Moshe Ya'alon repeated that Latin expression just two weeks ago.